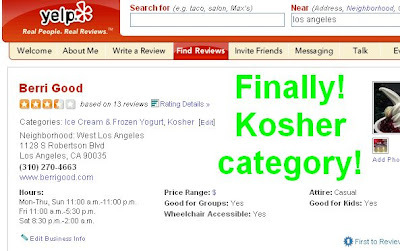 Introducing the Kosher Category on Yelp! It is about dang time. I have been sending Yelp email requests for MONTHS. Last month, if you read and/or wrote a restaurant review on Yelp, you could not categorize the restaurant as Kosher. Thai, Mexican, Sushi Bars, Pizza, Diners, Seafood, American, yes. Even lesser known categories like Creole, Halal, Taiwanese, Singaporean, and Raw Food, yes. Raw Food! But Kosher, no. Why is that so wrong? Because people who keep Kosher (and there are many) and turn to Yelp for information on restaurants where they can dine, well, they are left [BEEP] out of luck. Until now! Maybe it was my consistent harassing to their Feedback Department and uncompromising loyalty to the Kosher-keeping folks out there. 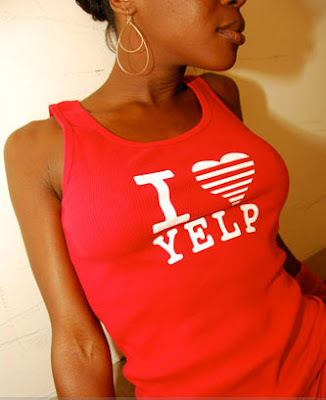 I'd love to think that I singlehandedly moved Yelp Headquarters to action, but I'm sure there were other frustrated Yelp users longing for this same category and also informed Yelp. Now that Yelp recognizes Kosher as a type of cuisine, as it should, I need your help! Next time you see a Kosher restaurant listed on Yelp, please edit the categories to include Kosher. A lot of Kosher places are still missing their label. We've got to work backwards to make up for lost time!